If you’ve ever had to set up merchant services for your ecommerce website, I’m sure you’ve experienced the urge to pull out hair, the uncontrollable outbursts of aggravation, or the urge to give up. Being on the developer side and having to integrate merchant services only brings on more side effects, but after countless phone calls with several merchant gateway companies, and prodding them with questions, I finally have a grasp on how it all works. Understanding how to accept credit cards on your website can be tricky to comprehend. There are many different components and it seems like no one really understands them all except the banks that want you to use their merchant services. Letting your customers pay with their credit card directly on your ecommerce site simplifies the checkout process, therefore you should take the time to understand how it works. To achieve this, you need to integrate a payment gateway with your ecommerce store. Read on for some simplified definitions and what you need to consider when choosing a gateway. A payment gateway is a service that can be integrated with your ecommerce store which will allow for shoppers to securely pay with a credit card directly on your website. Once the shopper has entered their credit card information and submitted their order, your website sends the payment information to the gateway to authorize the transaction. The payment gateway checks that the credit card information provided matches the information on file with the credit card company and that there are funds available on the card. The gateway also uses an Address Verification Service (AVS) that compares the billing address provided by the shopper with the one on file with the credit card company, and then kicks back an AVS code to tell you (the merchant) if they match. Once the payment is approved, the payment gateway will transfer the funds to your merchant account. A merchant account is like an online temporary bank account. Once an order is placed on your website, the gateway authorizes the transaction and transfers the funds to the merchant account. The money is then held in the merchant account for a period of time (usually 2 to 7 days), and then transferred to your physical bank account. You must have a merchant account if you want to use a gateway and accept credit cards on your website. So, how do you choose a payment gateway? There are so many options to choose from and it can all be very confusing, but there are some important details to keep in mind when making your decision. You should be able to answer the following questions before making your decision. 1. 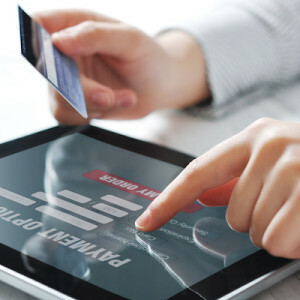 Which payment gateways are approved with your current ecommerce platform? This is the first thing to consider when choosing a payment gateway. All ecommerce platforms are different and have different gateways that integrate with them. Most ecommerce platforms also have gateways that integrate better than others. For example, Volusion accepts many different payment gateways, but not all of them integrate fully. If you use a gateway that doesn’t fully integrate, then you won’t be able to capture funds, give refunds, etc. from the back end of your website. Make sure you choose the gateway that integrates best with your platform and you will save yourself a headache in the future. Every gateway has a set of fees…some of them are a bit heftier than others. If you are worried about how much money stays in your pocketbook (keeping it old-school) then you will want to look into the fees associated with your desired gateway. Below are the most popular gateways and their respective fees. The fees listed are subject to change, so make sure you do your research and I suggest calling to your gateway to make sure you’re getting the best rates available for your situation. 3. Will you be able to use the same gateway with multiple websites? How many ecommerce websites do you manage, and do you plan on accepting credit cards on all of them? If so, Do you want to use one gateway for all of your sites? You’ll need to make sure the gateway you choose will allow you to integrate it with multiple sites. You can have your merchant set up separate merchant ID numbers to keep your income from multiple sites nice and organized. Contact your merchant provider for more details on how to do that. 4. Do you need to use Recurring Billing? Many merchants need to charge their customers monthly. If this is functionality you’ll need, make sure you check with the gateway that this is possible. Examples of companies with recurring billing are subscription based services (such as netflix or birchbox) and non-profit organizations that may have recurring monthly donations from their supporters. 5. Does the gateway support your desired payment methods? Not all gateways accept all forms of payment. Consider the types of cards and payment methods you want to accept on your website. Some gateways do not accept American Express, or more obscure payment types that are used in other countries. You’ll need to think about the payment methods most of your shoppers will be using and make sure the gateway you choose can accommodate those. Overall, when you’re selecting a gateway, your best bet is to collect the most information you can about the providers you are considering. This will allow for you to make an informed decision. Keep in mind that reputation should be a key factor in your decision as well. Gateway providers like Authorize.net and Paypal have great customer service and are happy to answer any questions you may have. I have called these companies several times with setup help, general questions, and integration issues, and they are always more than willing to explain how it all works in detail, all you have to do is ask. Integrate a gateway to allow shoppers to pay with their credit card on your site. Have more to add to my insight? Leave a comment below!